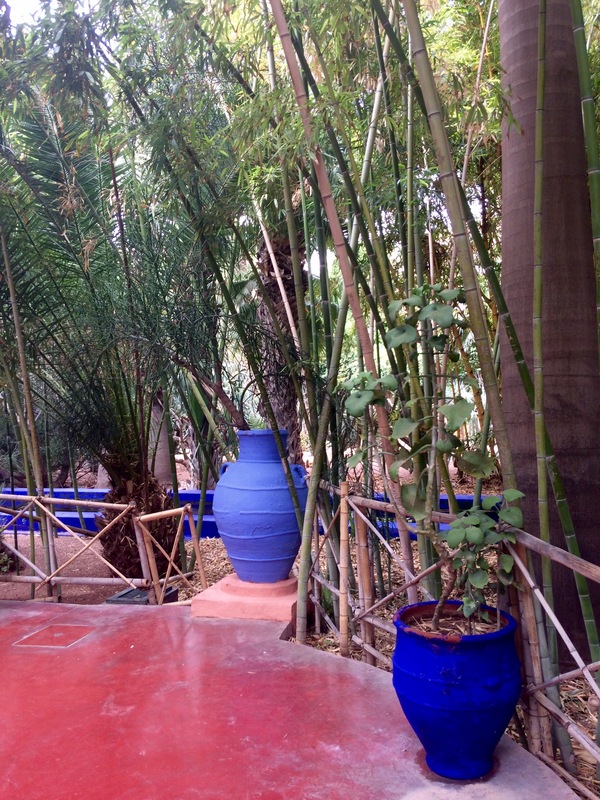 Jardin Majorelle is one of Marrakech’s most visited sites. 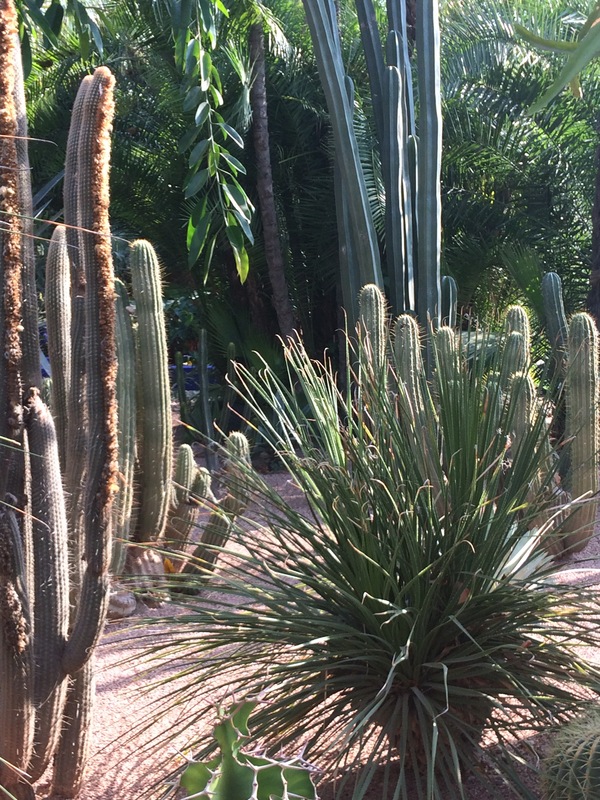 The 12 acre botanical garden is home to a remarkable collection of cacti and other drought tolerant plants as well as home to 15 bird species endemic to North Africa. 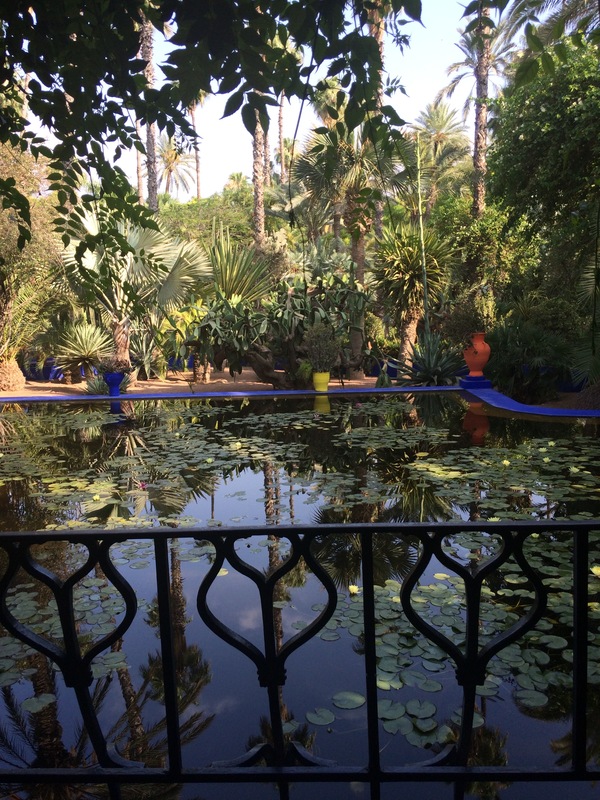 The garden, open to the public since 1947, was created in 1924 by the expat French artist, Jacques Majorelle(1886-1962), son of the celebrated Art Nouveau furniture designer, Louis Majorelle and is considered Majorelle’s most famous artistic masterpiece. 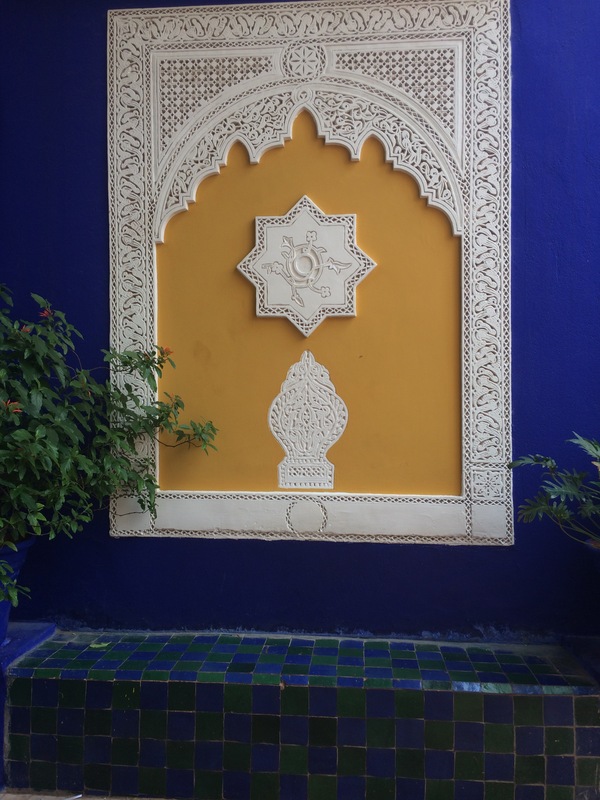 After researching some of Majorelle’s artwork, I think he was quite a talented artist as well, his work vibrant and alive with all the rich colors of Morocco. 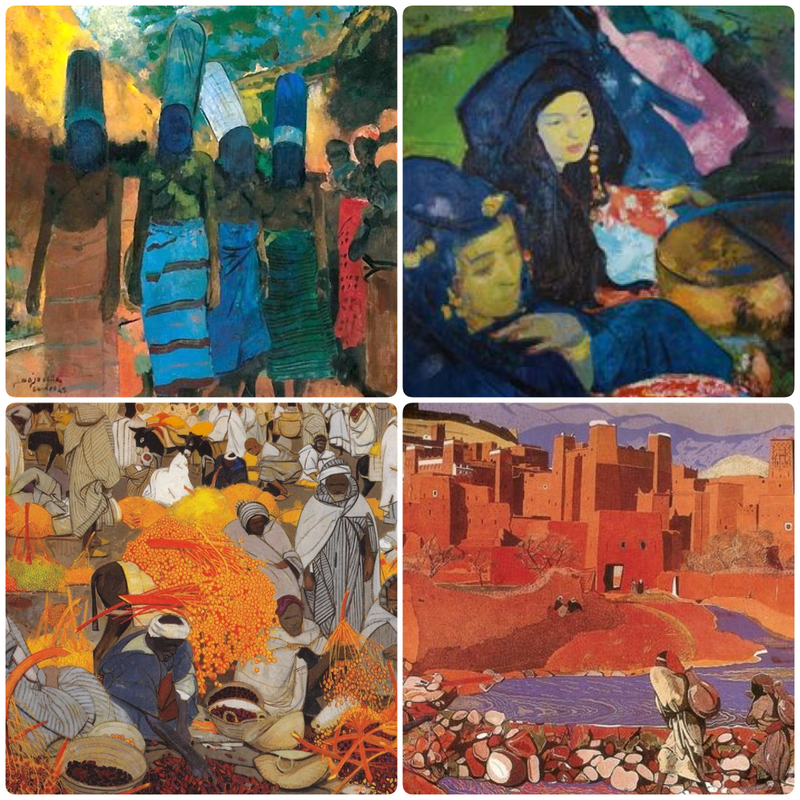 Jacques Majorelle artworks, clockwise from upper left, Femmes de Guinée, Les danceuses de Guedra, Ait ben Haddou, Vallée de l’Oued Mellah, Marché des dates à Marrakech. Google images. May be copyrighted. Louis Majorelle (French, 1859-1926). 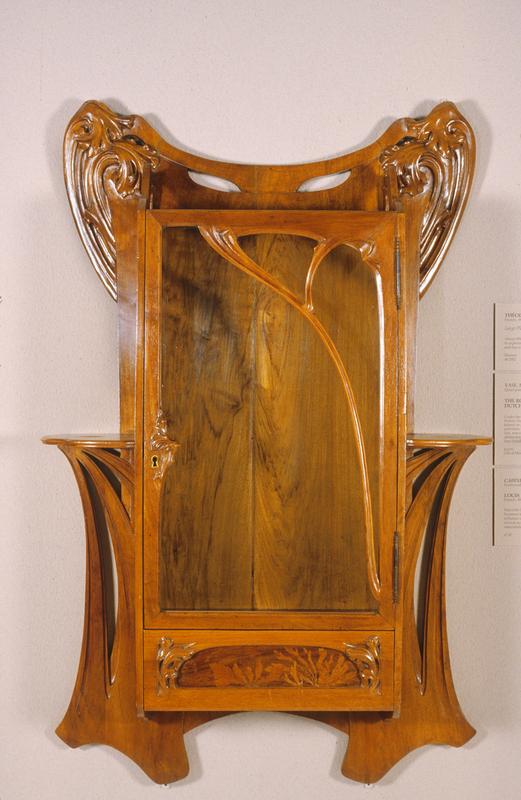 ‘Wall Cabinet,’ late 19th century. fruit wood with marquetry. Walters Art Museum (65.87): Museum purchase, 1974. 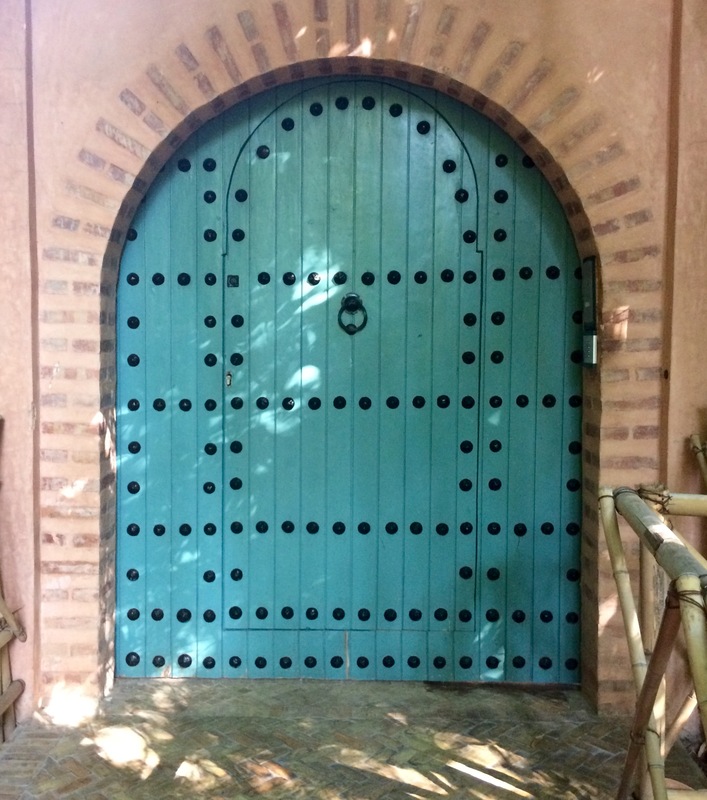 The artist’s former studio now houses the Islamic Art Museum of Marrakech where some of his paintings are on display. A separate admission fee applies. 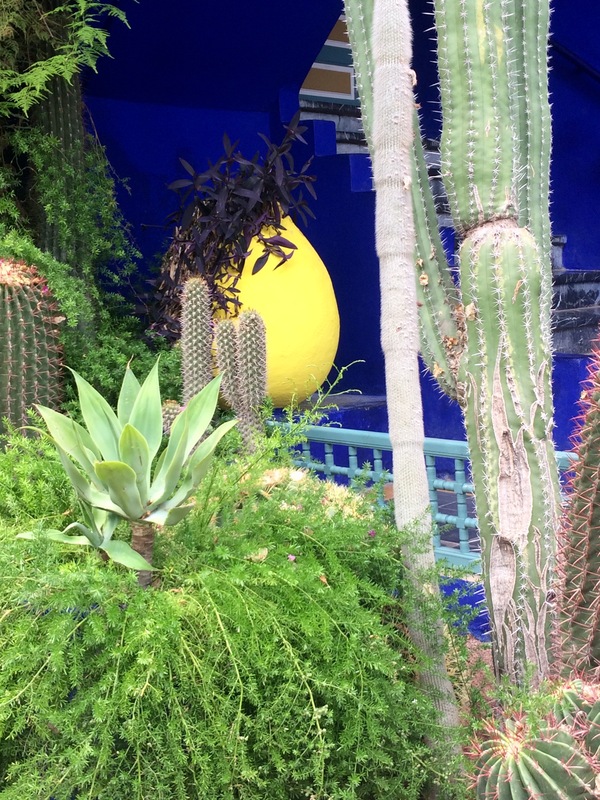 In spite of its impressive specimen collection of cacti, Jardin Majorelle is famous for its blue accents. 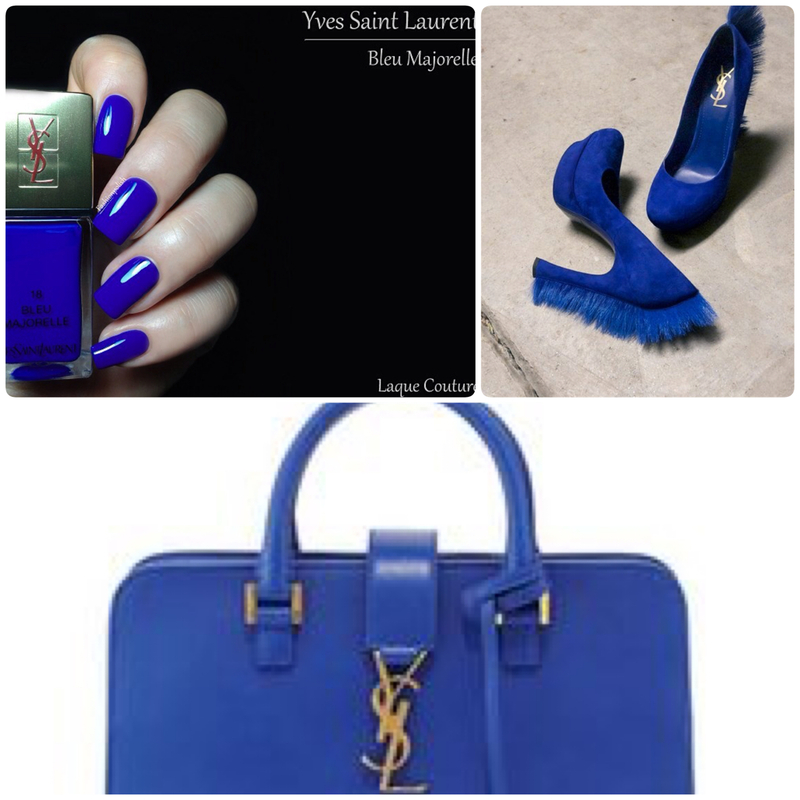 At every turn, visitors are seduced by the most stunning shade of electric cobalt blue: intense, fresh, captivating. 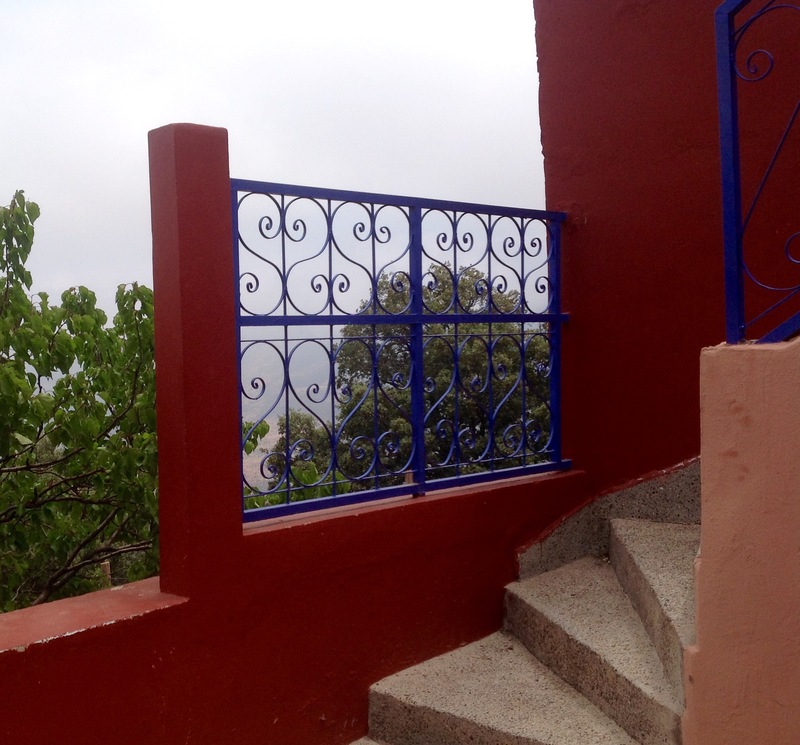 It is painted on garden walls, fountains, pottery, on the villa itself and used as vivid accents. 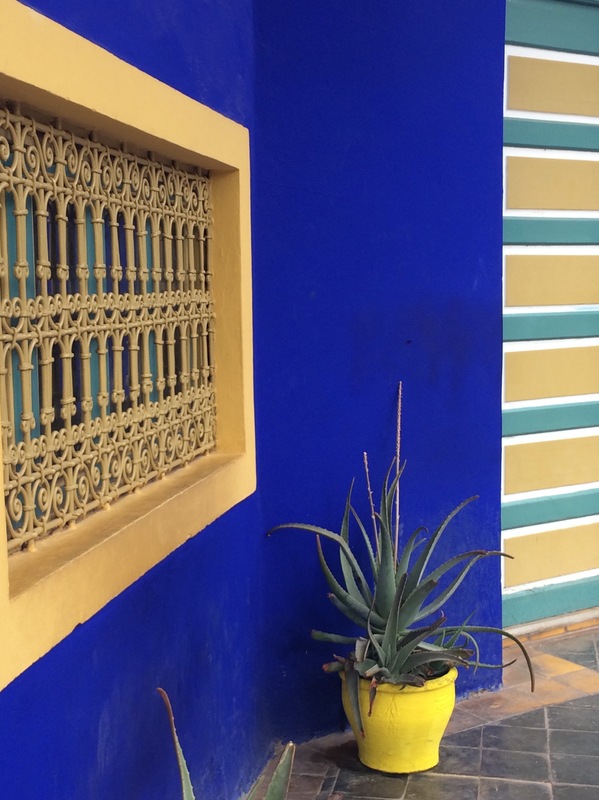 The blue is so famous it has been named Bleu Majorelle. 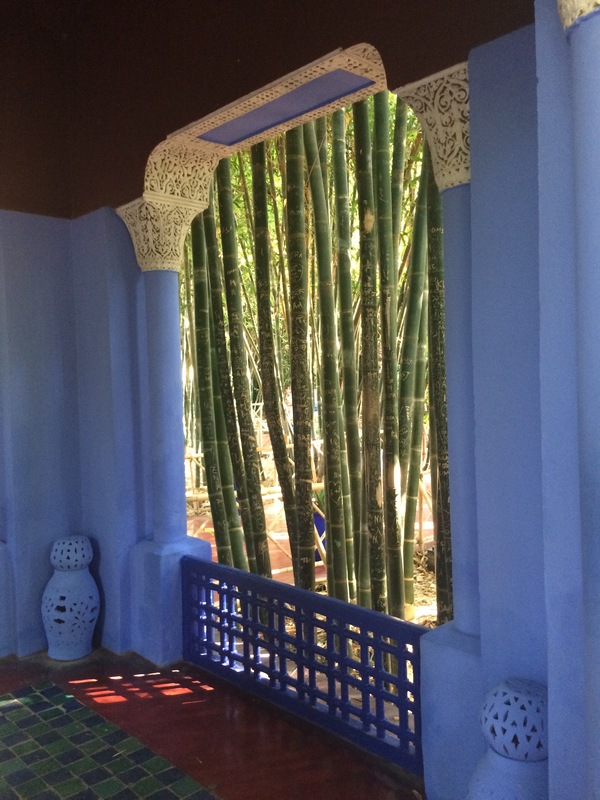 Jacques Majorelle was inspired to create this shade of blue by Moroccan tiles, Berber burnhouses, and by the blue painted around the window frames of native adobe homes. 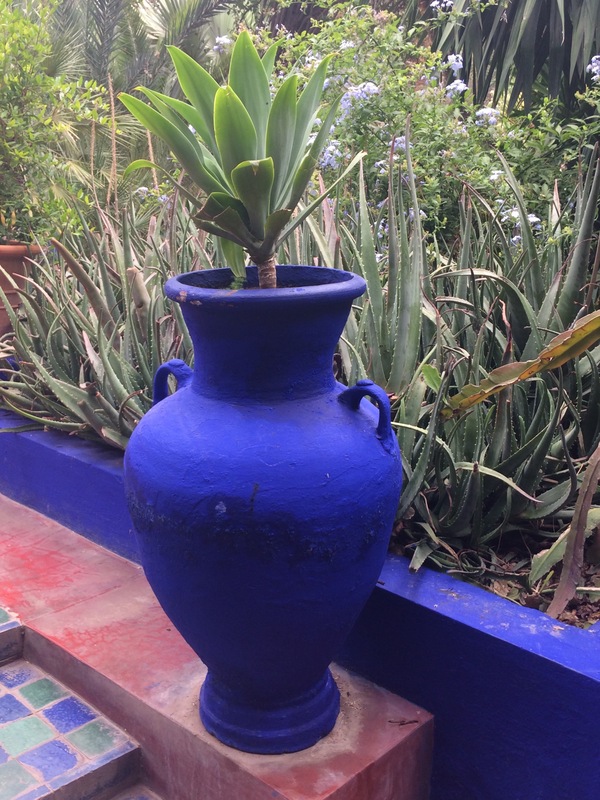 As I traveled through Morocco on a recent trip, this bold blue also captured my imagination especially in the Sahara Desert region where the contrast of the blue with the reddish/brown landscape really popped. 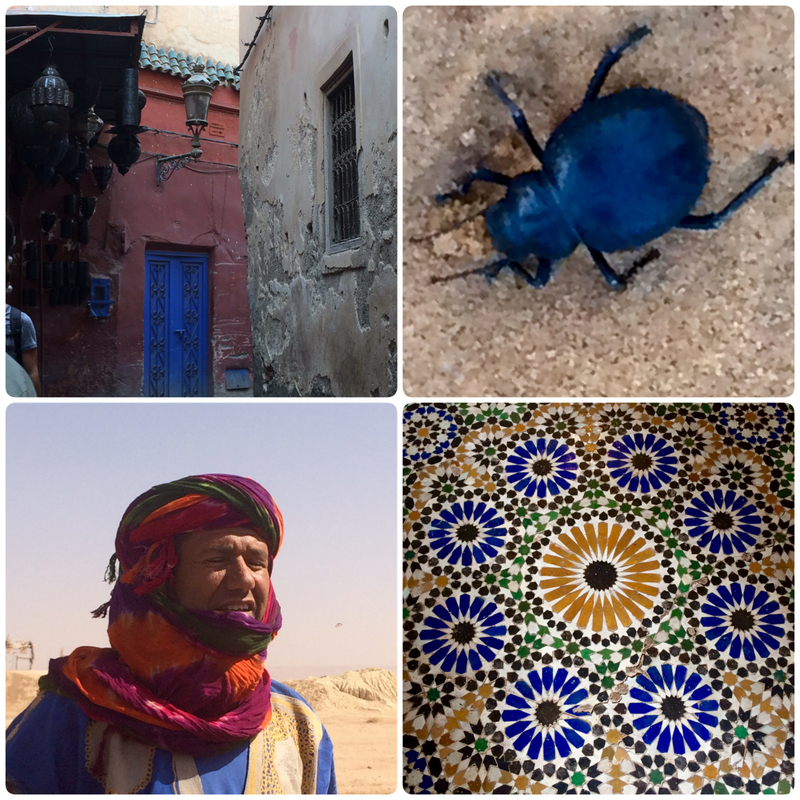 Clockwise from the top left, a home in the Marrakech Medina, a Scarab beetle in the Sahara Desert coming to hydrate itself in some water I spilled, stunning zellige tilework in Marrakech, a Berber native who taught us about irrigation practices in the desert climate. In the Ouarzazate region of Morocco. The garden cleverly recreates this contrast in its red painted pathways. 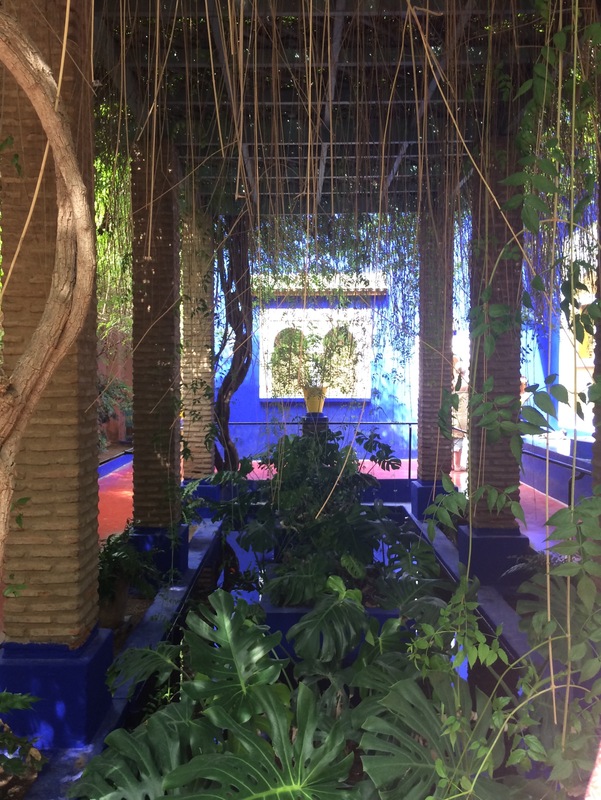 In 1980, the famous French designer Yves St-Laurent and his partner, Pierre Bergé, bought the Jardin Majorelle and began restoring it to its present glory. American landscape designer Madison Cox is responsible for installing the current flora. 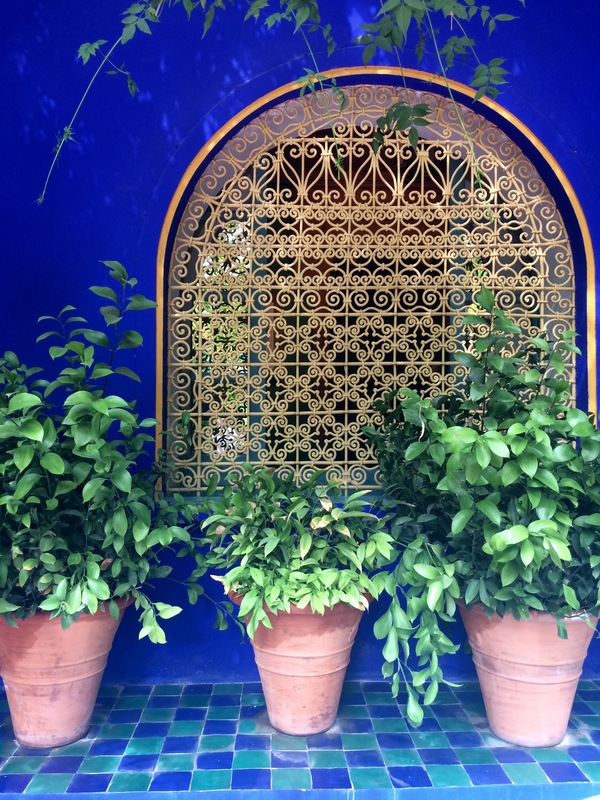 Yves St-Laurent was not a gardener himself but appreciated gardens, loved Morocco and with his acute design eye helped create the Jardin Majorelle of today. 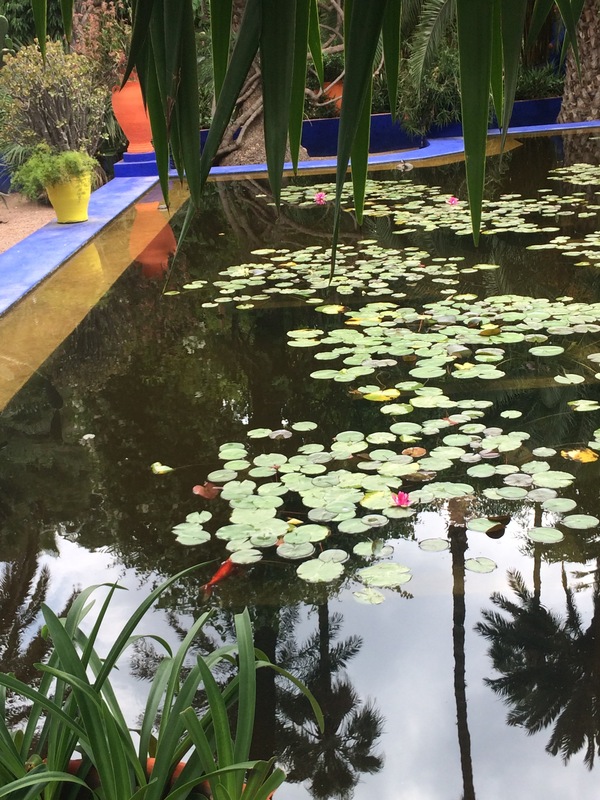 It was YSL’s idea to punctuate the landscape with planters painted in bright colorful shades throughout the garden. 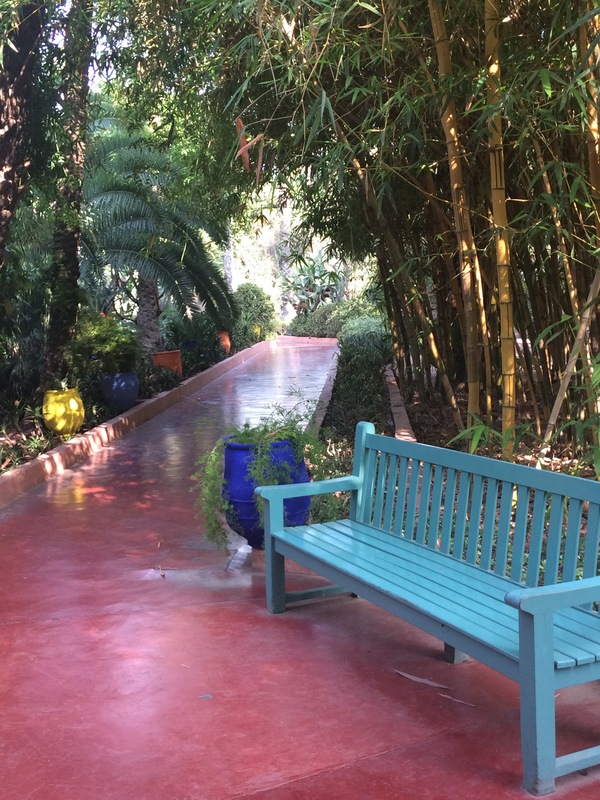 The tropical, lush garden delights at every turn. There is lots of seating available in shady areas for rest and contemplation. 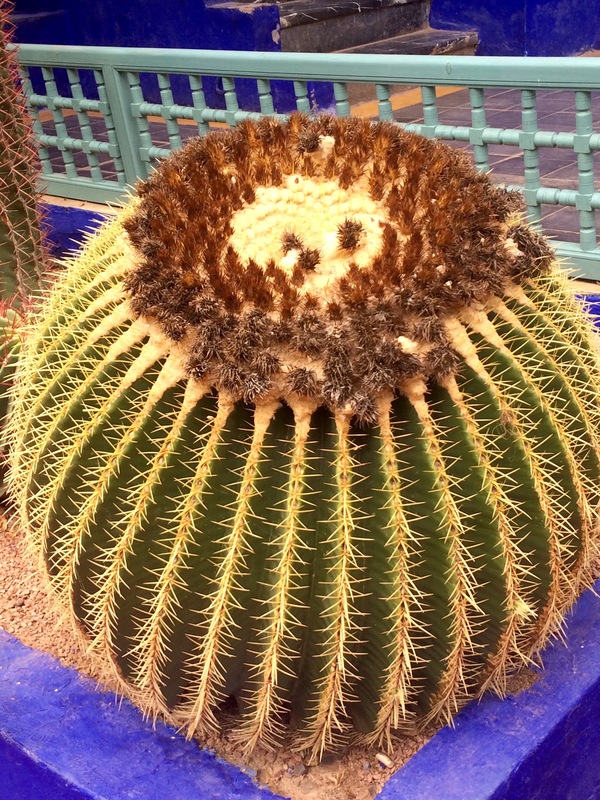 With over 800,000 visitors annually, the gardens can be crowded however and long entrance queues can be frustrating, although on our visit we experienced neither. 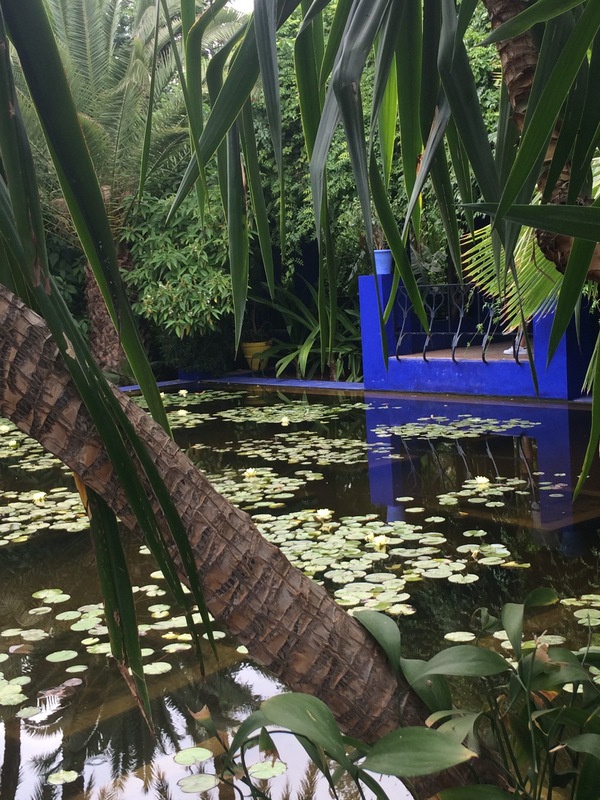 Being French, a passionate gardener and an artist, it was a longtime dream of mine to visit Jardin Majorelle. 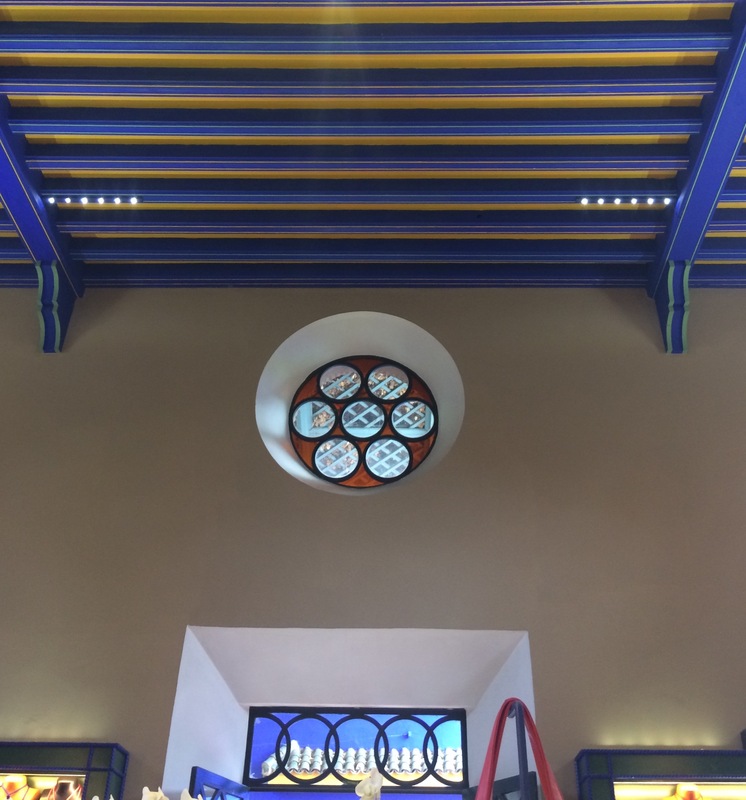 I invite you to join me on a photographic tour of my recent visit. 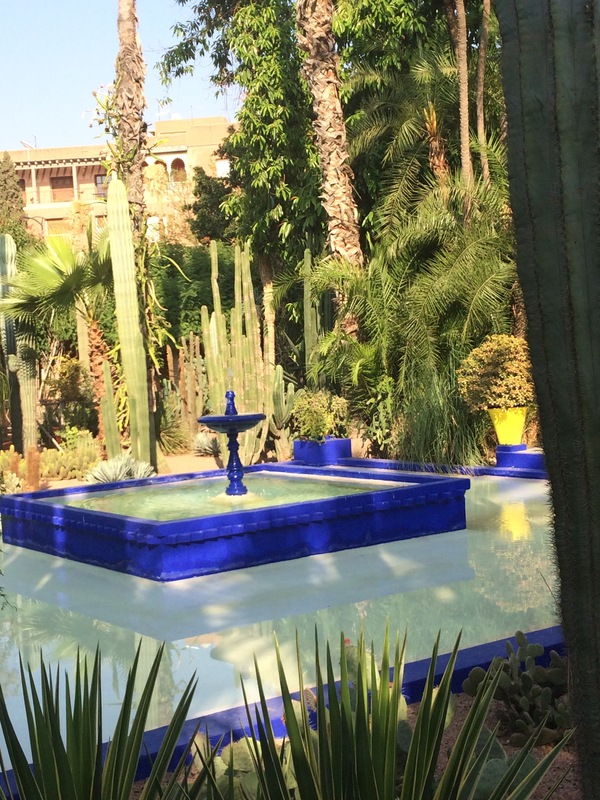 YSL died in 2008 and his ashes are scattered in Jardin Majorelle. 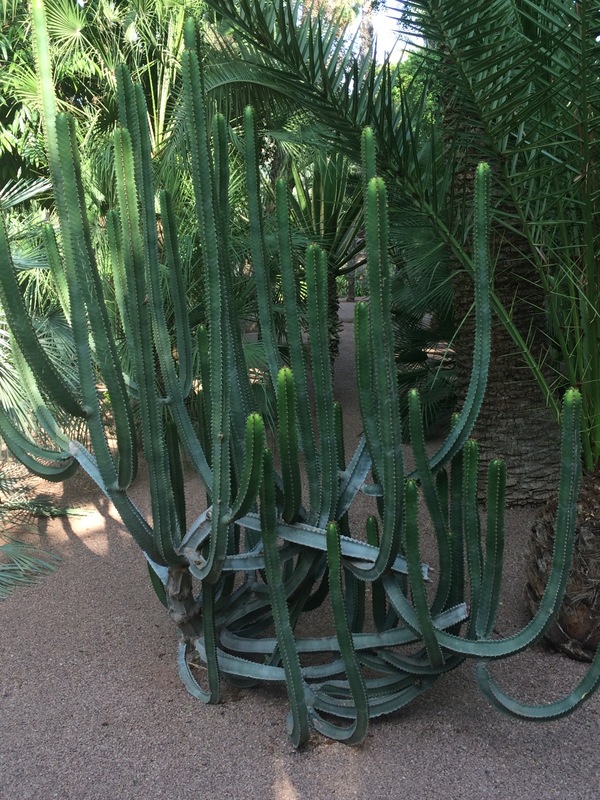 A tribute memorial to the design genius has been installed in a quiet corner of the garden. 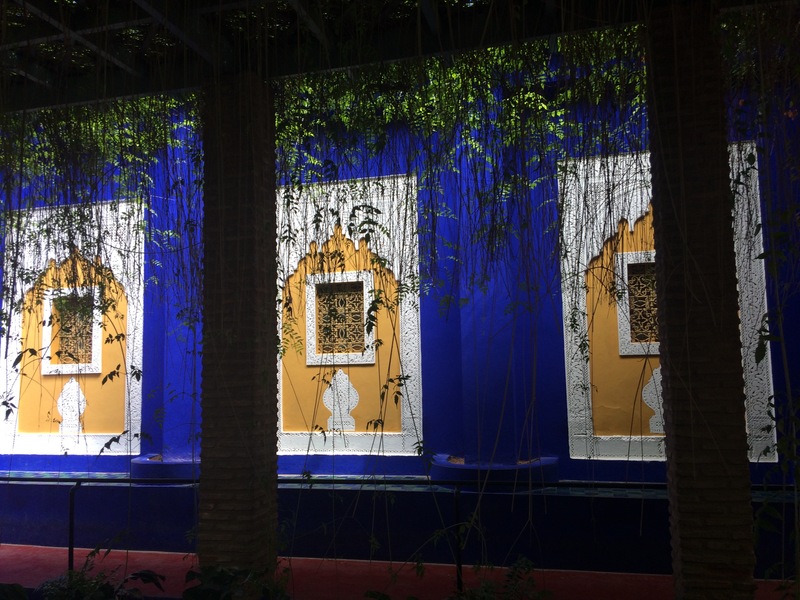 In 2015, Pierre Bergé auctioned off the couple’s collection of Moroccan treasures and the proceeds of the sale were used to fund the Jardin Majorelle Foundation and to finance the nearby YSL Museum, due to open by the end of 2017. The foundation is involved with charitable work as well, hosting AIDS clinics and funding youth orchestras. 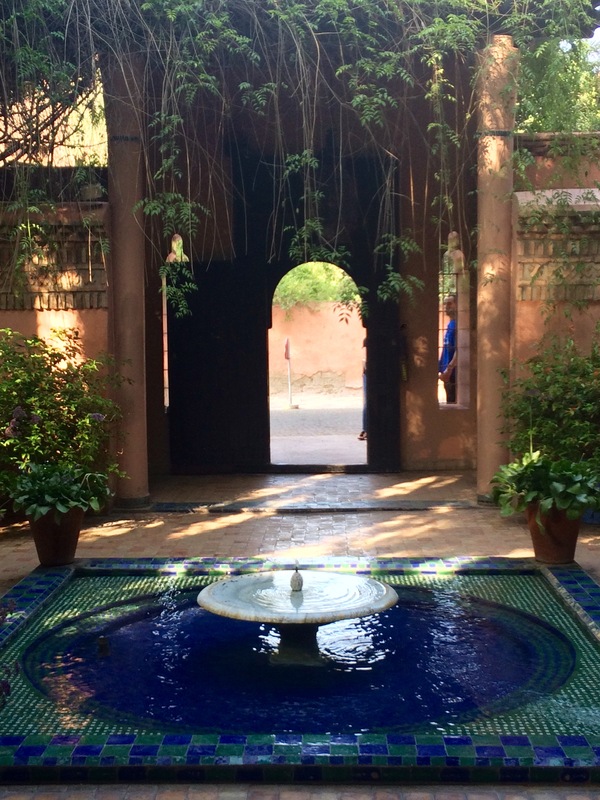 When Pierre Bergé dies, the seldom seen Villa Oasis will also open to the public. 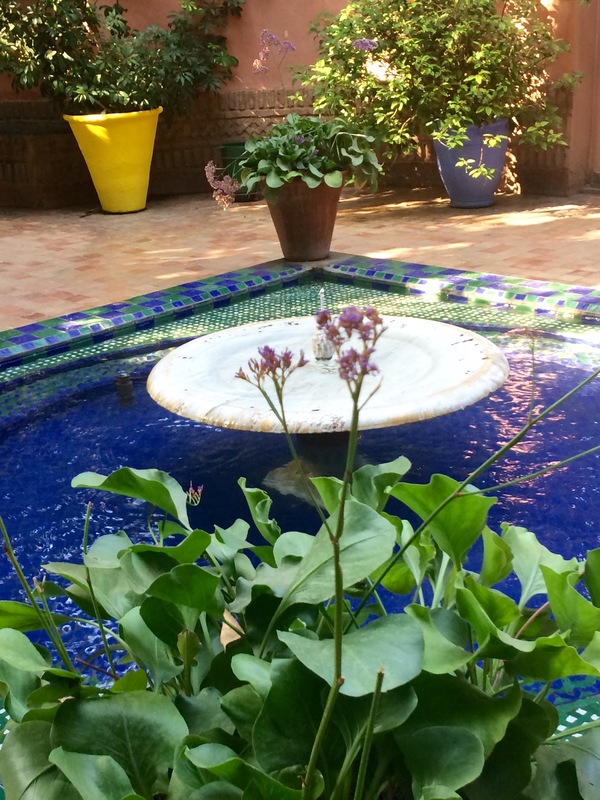 The garden boasts a lovely outdoor courtyard garden café where we enjoyed a fabulous lunch. Covered seating is also available. 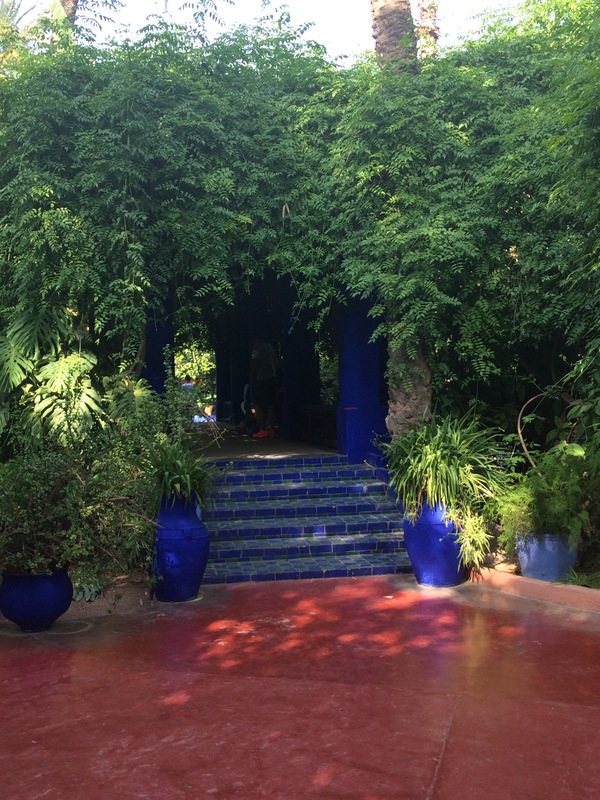 When I was researching this article, I read that the Bleu Majorelle was an YSL creation. 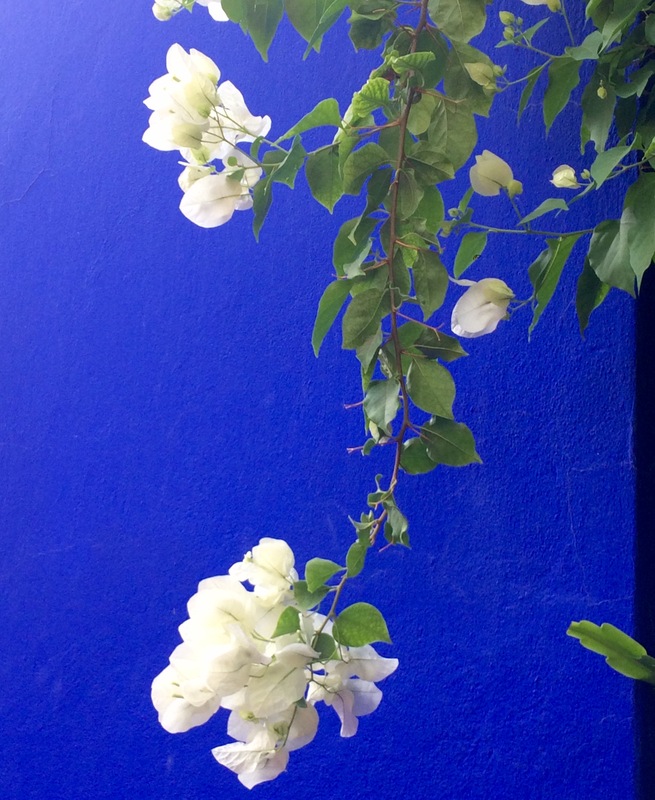 Although YSL’s designs often featured this gorgeous blue, the color was the artist Jacques Majorelle’s creation. 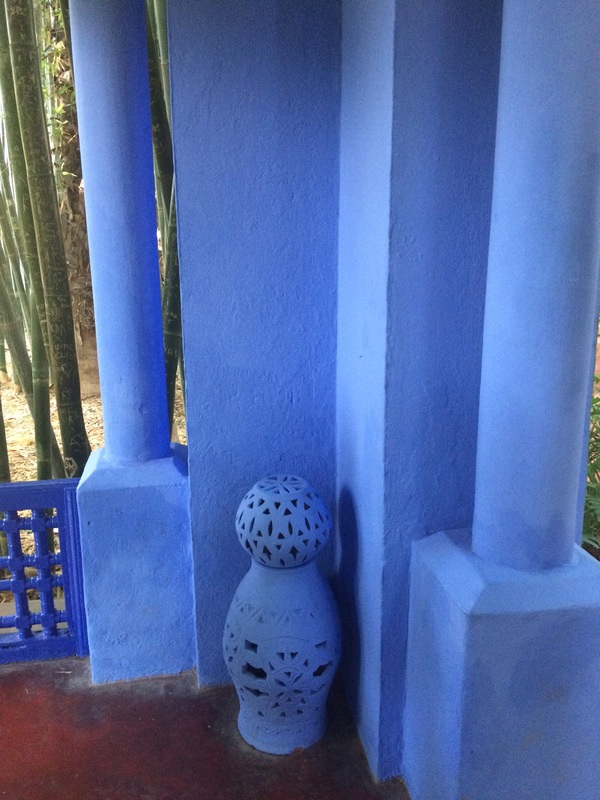 The gift shop does sell cans of Bleu Majorelle latex paint. I was hoping to find it in an artist format for my own artwork, without luck. This deep saturated blue just does something to one’s soul. It is intoxicating. 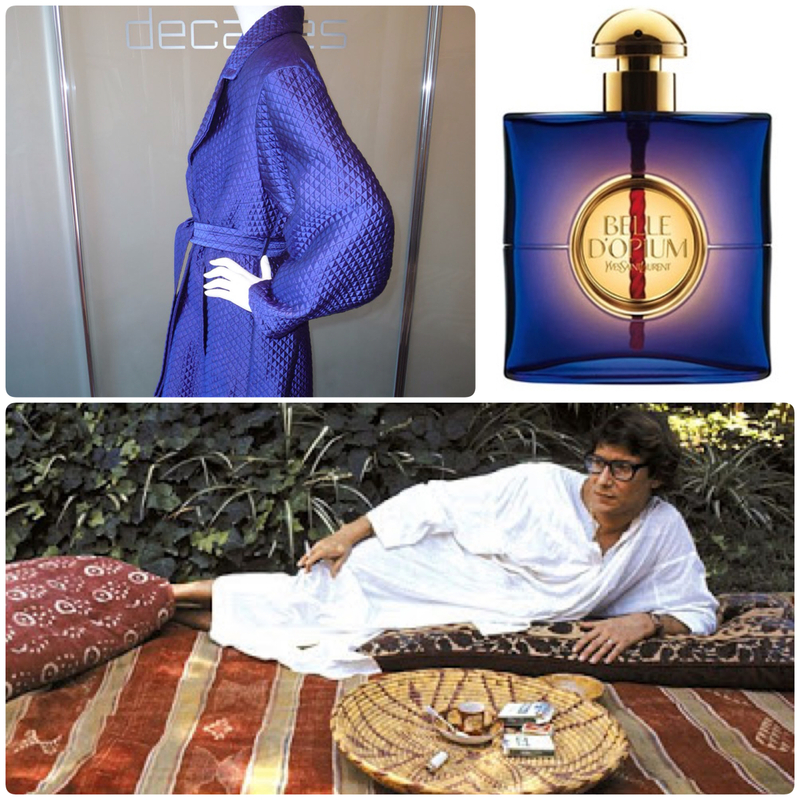 Yves St-Laurent designs in Bleu Majorelle. The artist in the gardens in the 1980s, below. Google images. Copyrights may apply. All photos are my own unless noted. 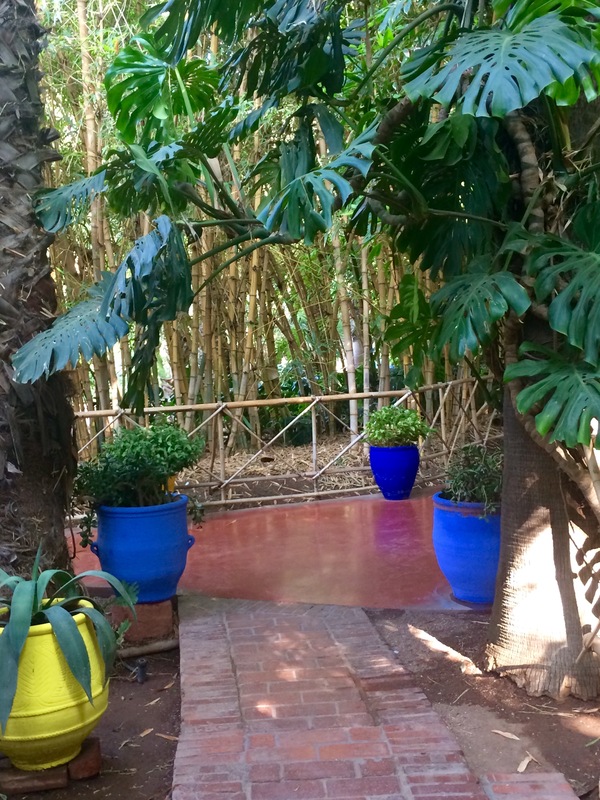 This entry was posted in Gardening and tagged Jardin majorelle, jardin majorelle marrakech, Pierre Bergé and Yves St-Laurent garden, YSL garden, Yves St-Laurent garden, Yves St-Laurent in Marrakech by Johanne Lamarche. Bookmark the permalink. Totally seductive! Love that blue and the sampling of art you researched. Wish I had been along but you took me there without the plane. Thanks for your vision. LOL. You are destined to go to Morocco Elaine!!! And I predict you will return with a suitcase full of pottery in that blue and loads of spices. Thinking and praying for the UK today and all of the world. So so senseless and sad. I just realised…even my jacket in my gravatar is that colour!!! J’espère que tu pourras visiter ce magnifique jardin un jour aussi Christine! Très unique et avec sa sensibilité artistique, il te plairerait énormément. Bises. Just stunning Johanne, I can only try to imagine what it was like to experience le Jardin in person!! 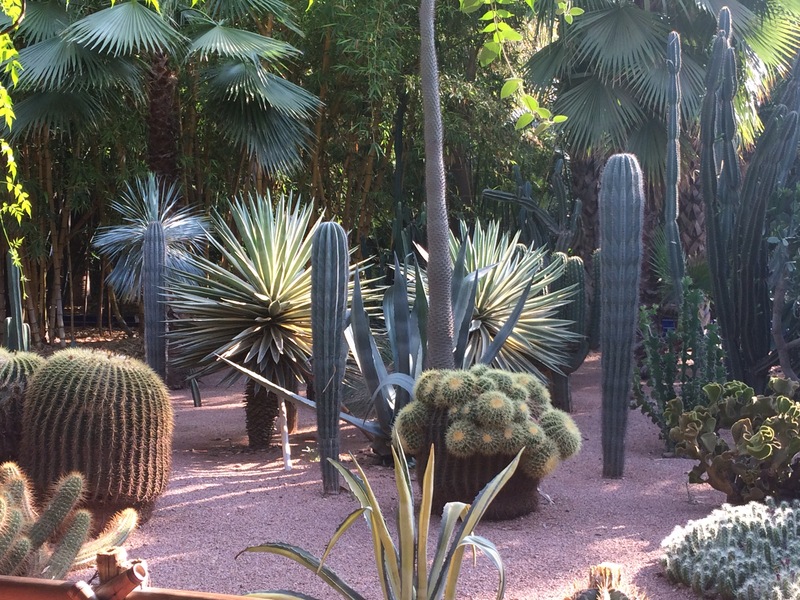 Those cacti, that BLUE! Magnificent!! 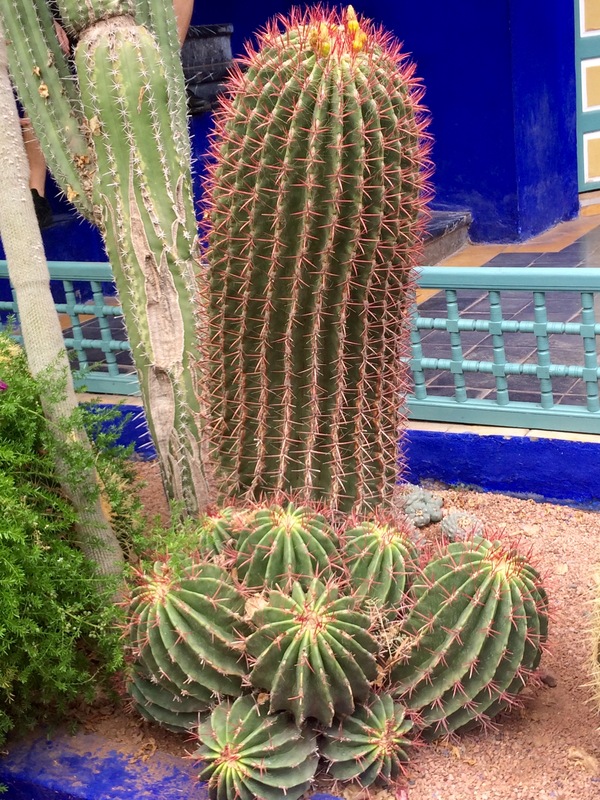 As an artist this is a garden that would truly speak to you Jenna. Glad you enjoyed touring it with me. 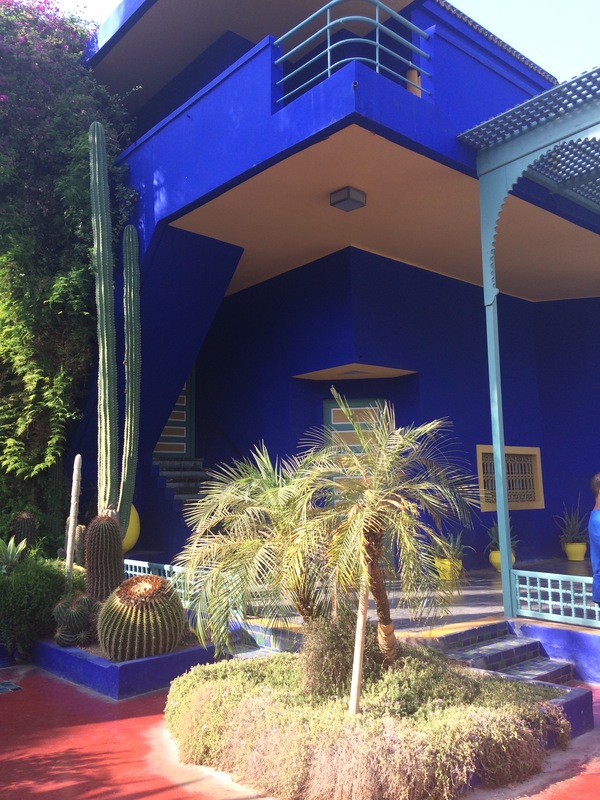 Jacques Majorelle was unknown to me and I loved researching his artwork. 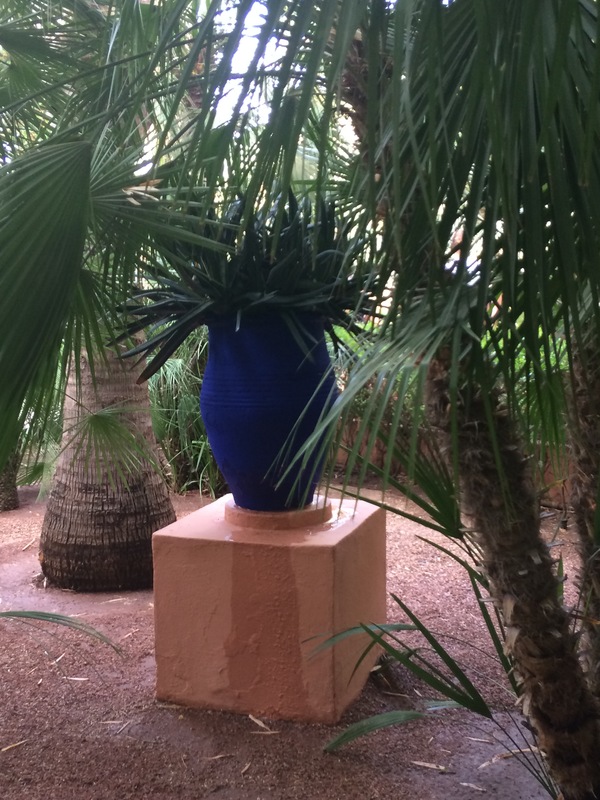 Merci Johanne , pour les belles photos avec les belles couleurs vives tel que bleu , turquoise , el les cactus tellement différent .. tu semble avoir passer un très beau voyage ! Johanna, what a fun read – and it’s like looking at a different world! Such a diverse and culturally rich country with wonderful people. At times, especially in the heart of the Sahara and its nearby oases, it was like being live in a National Geographic magazine. Loved the country. Traveled with my oldest son, 24, a history graduate. Never thought I would enjoy blue so much – the pictures are just beautiful! That blue really is intoxicating. One would think it could. E overpowering but it is not. I think the tropical plantings can hold their own against the electric blue. 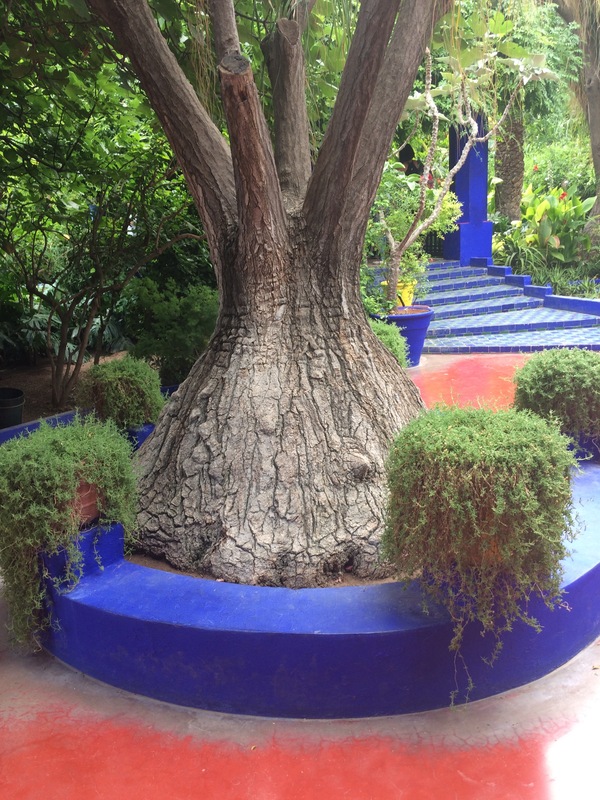 Glad you enjoyed visiting Jardin Majorelle with me Judi. C’est bon! 🙂 Love that blue!